Home / News / 5M BACK IN SPACE! 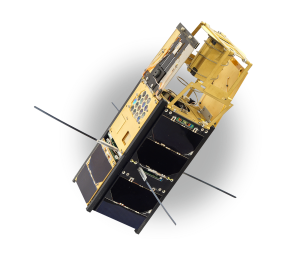 On June 23, 2017, the first Czech technological nanosatellite VZLUSAT-1, designed for testing new devices and technologies, was successfully launched into space. The nanosatellite was developed in collaboration with VZLU (Research and Testing Aerospace Institute PLC), commercial companies and universities. VZLUSAT-1’s task is to verify two major technological experiments: a miniaturized X-ray telescope and a composite material for shielding cosmic radiation, and a scientific experiment QB50 FIPEX. Since 2003, this satellite has been the first to be up into orbit and we are pleased to inform you that 5M is a founding member of a conspiracy which VZLUSAT-1 has implemented. “VZLUSAT-1 was successfully launched and after 3 flights past Earth, with the first possible contact with the ground station, we heard it in Pilsen. So the satellite survived the start and we have found it! We are also the first to make contact with the satellite from all of our participating teams,” said Richard Pavlica MSc, Member of the Executive Board of 5M LLC. The VZLUSAT-1 nanosatellite was launched from India into orbit up to 500 km within the QB50 international mission together with other 50 nanosatellites of the same size. The expected life in orbit is several years, then it burns in the atmosphere.